It's a cold windy day at the Brands Hatch racetrack and Formula 1 fans have turned out in full force to watch the race. Amidst these fans is a young lad looking fascinated as the race cars go by. He isn't supporting any one car, but it's the entire spectacle that captivates him. Time passes by. That young lad is now a grown man. And he no longer returns to the racetrack as a spectator. 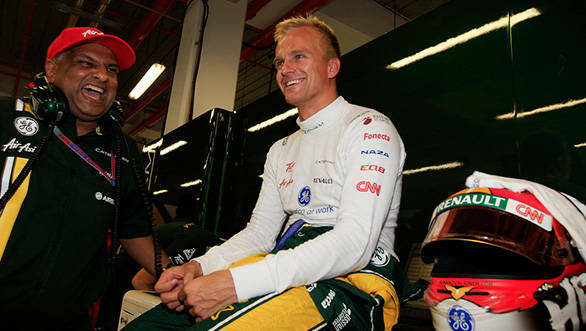 He's far more involved in the sport now - after all, he's the man at the helm of the Caterham F1 team. Yes, it's been quite a journey for Tony Fernandes. "F1 is the shop window, the platform we use to showcase the talents we have within Caterham Group, but the key was to create something of our own. We could have just sponsored a winning team, but that's not my way," says Tony Fernandes of his decision to break into the sport he grew up watching. Of course, Fernandes' involvement with Formula 1 started a little before the Caterham F1 team came into being. His airline, AirAsia, sponsored the Williams F1 team between 2007 and 2009, and it was this association that first taught him the inner workings of Formula 1, with Sir Frank Williams and Patrick Head as his tutors, no less. Eventually, when there were three new teams lining up on the grid for the 2010 season of Formula 1, one amongst them was the brand spanking new Team Lotus - in the same iconic livery as the Team Lotus of the days of yore. Of course, the Team Lotus that came into being in 2010 was in association with Proton, the owners of Lotus road cars. Things then got messy, with the Lotus name appearing on the grid for two separate teams in 2011. Finally in 2012, it was Caterham F1 that took to the grid. "We launched our JV with Caterham Cars and Renault last year in Paris and I said then that F1 was always going to be our entry point into the automotive world. The original plan was with Lotus, but that obviously didn't work out, unless you're a lawyer, so we switched our attention to Caterham and now we have an F1 team with the foundations laid for long-term success on track, and an automotive and technology group in place with a very bright future ahead of it." The legal hassles of nomenclature aside, breaking into Formula 1 wasn't an easy task. But Tony Fernandes, as the world soon discovered, wasn't the sort of man to baulk at a challenge. "With AirAsia we built the airline from just two planes and a launch date the day after 9/11, with nearly every expert telling us we didn't have a prayer, and now we're the world's most profitable airline, we've enabled 150 million people to fly and just been voted world's best budget airline for the fifth year running. That's taken just over 10 years, and we'll do the same with Caterham," he says. And it was realistic results that Fernandes aimed for from the team's debut season. They targeted a tenth-place finish in the championship - which meant they'd be the best of the three new teams on the grid. It was ambitious. But they achieved exactly that. Was it easy though? In Fernandes' own words, "It was a huge, almighty struggle, but that was one of the strongest motivating factors." They had been told that it was impossible to build an F1 team in six months. But at the 2010 Bahrain GP, exactly six months to the day since their F1 entry had been granted, both their cars finished the race. As the season progressed, tough though it might have been, they found their foothold in Formula 1, and planned not only to cement their place in the paddock, but to rapidly rise through the ranks. "It's up to us to force our way into the midfield, to become an established team. It's taking longer than I'd like, but I'm realistic enough to know how big the challenge is that faces us," he declares. The results in 2011, were something like 2010 - the green and yellow squad finished tenth in the championship once again, and was once again ahead of Marussia and HRT. It was 2012, however, that was the team's toughest year in Formula 1. "It would be easy to come up with excuses, but the fact is F1 is tough, otherwise it wouldn't be F1," Fernandes declares. Once again, the team had finished tenth, ahead of the other two teams. "The season wasn't over until the end of the Brazilian Grand Prix and we never let our spirits drop, never gave up. It's the same this year and it'll always be the same," he says. 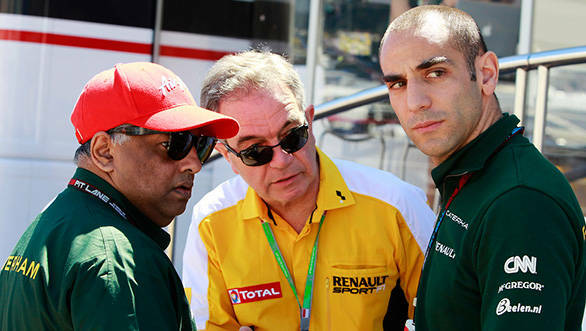 In fact, 2012 was also the year that Fernandes decided to step down from his role as Team Principal, and surrender control of the team to someone else. "I have a number of major business interests and I can't micromanage each one. I set them up and hand them over to the right people to take them on and help them achieve what they are supposed to do." In the case of the Caterham F1 team, it involved relinquishing the day-to-day running of the team to Cyril Abiteboul. "With Cyril it's too early to judge him  we've only had him for six months, we shared him with Renault for the latter part of 2012, but under his stewardship it will pay off. He knows the sport, he knows the business world and he's even more hungry than I am to succeed," he declares. And indeed, Caterham appears to be in able hands. After all, Fernandes is quite clear about the fact that he likes working with 'experts'. For someone with business acumen of the sort that Tony Fernandes has, the decision to break into Formula 1, of course, wasn't something that was just a whim and fancy. The fact that he was willing to put his money where his passion lay in itself indicated that there was a long term plan in place. "For me it's simple. I don't hope, I expect. I expect us to join the midfield, I expect us to one day challenge for points, podiums and championships, and I expect us to do with a style that is ours." Another indicator of Caterham F1's commitment to the sport is that they also have a GP2 in place, along with the Caterham Racing Academy. To nurture their own talent then? "Exactly. GP2 and the Caterham Racing Academy give us the chance to blood new talent in the harshest possible environment, putting drivers, mechanics, engineers and everyone associated with a motorsports team right into the quickest learning environment they will ever face. It's a pressure cooker but one that creates opportunities for young talent to shine." Not a bad way to go at all. And like all things worth doing, it starts with passion and then snowballs into something entirely different. Fernandes declares, "First and foremost I've always been a fan. It's fast cars, the world's best drivers and some serious technology  that's a potent combination for small boys and grown men. But, more than just a sports team, F1 is our chance to show what we can do in the technological world. It's broadcast to millions of people, it inspires dreams and it's the pinnacle of sport and entertainment. That's a powerful mix and one we will profit from  maybe not yet, but we will." The world now has to wait and watch.